You can use the color picker to adjust the colors and transparancy for the widget foreground, background, text and temperature. There are two methods to pick a color using the color picker or entering a hex code. This DigiCal+ feature is available for all widget types. In the color ring you can hold and drag the small circle to choose a color. The circle in the middle allows you to compare the current color to the chosen color. The last horizontal line changes the transparency/opacity. 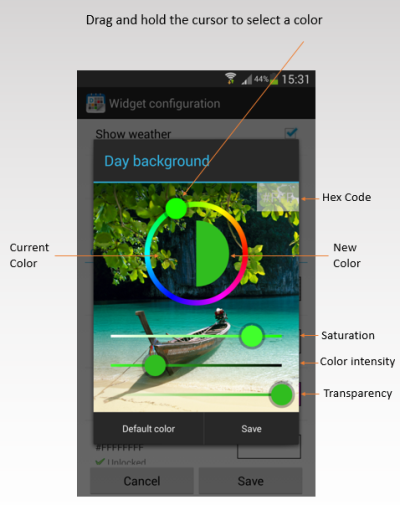 If you already knows what color you would like to use for your widget, you can also insert a hex code. This will allow you to always get the exact color you have in mind and you can keep the color consistent. You can also use a color picker to see what's the corresponding hex code. Hex code stands for Hexadecimal Color Code and it is a six digit way to represent colors in the form #RRGGBB (Red, Green, Blue). In the widget, the Hex Code format is ARGB format, the A representing Alpha, the level of opacity. If this value is not filled in, it will automatically be set to FF (completely opaque, i.e. not transparent), so you can choose to only make use of hex code in the format of #RRGGBB. 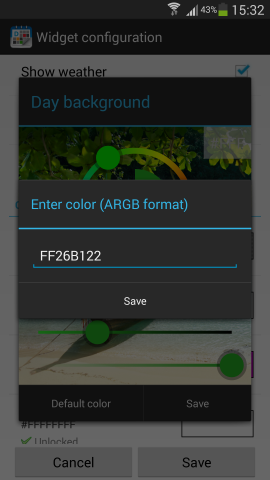 Tap the right uper corner (#FFF) in the color picker to fill in your hex code. After pressing "Save" your color of choice will be saved.